ATV is the student-run television station at American University, located in northwest Washington, DC. We produce nearly a dozen original television programs ranging from coverage of campus and local news to talk shows on various topics to comedy and entertainment. ATV is entirely a student-run organization, independent of the School of Communication. All of our programs are hosted, produced, edited, and managed by students, and students are also responsible for the management of the station, its studios, and its technical equipment. ATV’s offices, studio, control room, equipment, and broadcast control are all located on the second floor of the Mary Graydon Center in MGC 256, a location that we also share with WVAU and AWOL. ATV’s programming airs 24 hours a day on campus channels 2 and 5, and also via an online live stream on our website. We also publish our shows as video podcasts listed on iTunes, and publish highlights from our shows as clips on YouTube. ATV also produces promotional videos for other student organizations at American University through our Productions Department. In addition to producing great programming, one of ATV’s core missions is to provide students with a hands-on environment to learn many different types of skills in a film/television production environment. To that end, ATV has a number of departments mirroring those at a traditional television station, such as Public Relations, Programming, Information Technology (IT), Operations, Productions, etc. Students can create and produce their own show from scratch, or participate as crew members or on-air talent for existing shows. Many students who have been active in ATV have reported that the skills learned and experience gained at ATV opened them up to numerous internship and career opportunities. We welcome all AU students to participate at ATV, regardless of school or major, and absolutely no experience is required to join. We offer a wide variety of available roles with differing levels of commitment, so everyone can make their experience at ATV mean as much or as little as they like. And perhaps most importantly, working at ATV is lots of fun! If you’re interested in joining ATV, please fill out our Get Involved form and we’ll get in touch with you. ATV is a student-run media organization recognized and funded by the AU Student Media Board. ATV is advised by the staff of Student Activities and a staff advisor from SOC on organizational and technical issues. ATV retains complete editorial and programming independence for all of its productions, which are never subject to prior review by ATV’s advisors or any university officials. Founded in 1979, WAVE-TV was first recognized by the AU Student Confederation (the predecessor to the AU Student Government) in Spring 1981. The station finally went on-the-air on January 19, 1982 on campus-wide closed circuit television. Its offices were located in the Mary Graydon Center and would broadcast three nights a week (Tuesdays-Thursdays, 7:30-10 pm during its first season) from the AU Broadcast Center. WAVE was funded by the Student Confederation and by local advertisers. In the early 1990s, WAVE was renamed to A-TV2, later shortened to ATV. Most of the shows were broadcast in the Letts Hall Basement and SOC’s Media Production Center. Other programming included syndicated subscription feed programming from the National Association of College Broadcasters and the College Life Television Network. ATV also expanded to AU dorm rooms during this time and saw a significant expansion of its programming. ATV was also recognized by the Society of Professional Journalists, receiving the first place Mark of Excellence Award in sports reporting, sports photography, and overall newscast. Notable alumni who worked for ATV during this time include David Gregory (’92, now moderator of Meet the Press on NBC) and Chris Noll (’98, host of The Chris Wylde Show on Comedy Central, picked up directly from ATV!). Following AU’s renovation of Mary Graydon Center in 2002, ATV moved its studio and offices to the new location on the second floor, where it remains today. ATV also began airing 24/7 programming following the move to MGC. ATV launched its first minimal presence online in 2007, followed by launching an expanded, full-featured website in November 2009, when it also began livestreaming a simulcast of its on-campus broadcast for the first time. Around 2010, ATV began the process of redeveloping itself as a legitimate television station. ATV’s programming expanded to a dozen shows, developed a full-time 24/7 broadcast schedule, and expanded many of its supporting departments. The new ATV Productions Department spearheaded a partnership with the AU Student Government to produce the president’s “Fireside Chat” series, and connected with many other student organizations to work on video production projects. 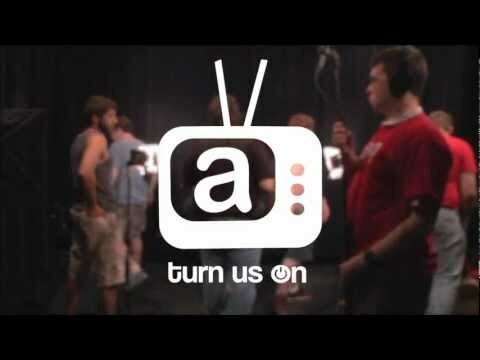 ATV launched its innovative new logo and “turn us on” branding campaign in September 2011. In 2012, ATV formed its first formal contracted video production agreement with AU’s Office of Campus Life, through which ATV’s Productions Department began producing marketing videos for OCL’s public use. ATV also began reporting from press events at the White House for the first time, becoming part of the White House Press Corps as a student station.